On the 12th March 2018 an event was held at Loughborough University by Red Vector Ltd (an independent energy consultancy firm specialising in interactive learning). The context of this workshop was regarding the energy sector, which is applicable to myself as I work with EDF energy – nuclear. Since the energy sector is being transformed, new solutions are being created as various organisations seek to address society's demand for energy in ways that reduce its environmental footprint. This creates opportunities for researchers - working with those organisations and individuals who are seeking to deliver innovative, low carbon energy solutions. Creating solutions to address this need is not just about technology, it’s about policy, economics, society and the business models that bring all of these together; thus providing an excellent route to create impact from work. The one-day workshop took the form of an interactive strategic game which was designed to give an experience of identifying, prioritising and managing relationships with those needing research outputs, in the hope of creating impact. The game was fun whilst giving experience of making effective, quick decisions around stakeholder engagement, delivering effective communication of work and most importantly delivering high quality research. The simulated research environment saw teams of 3 undertake 5 years of energy-related research starting from the point you finish your PhD. Resources (time and money) were given and had to be spent wisely to build influence, create academic excellence and in turn create impact. There were various routes of doing this within the game – Public funding, industrial sponsorship, academic excellence exposure and general expose e.g. building exposure from a website. In addition, various elements of chance within the game influenced how careers progressed, based on what we did and the opportunities created. I learnt a few important points from this workshop. Firstly, I found the workshop highlighted how important taking an impact-based approach is to project development. Secondly, how important being proactive and engaging with the right stakeholders is. Finally, it was interesting to see how many different avenues of exposure there are for work to gain impact, albeit novel ways such as producing videos, running research blogs etc. On another note, I felt the environment of the game allowed us to enhance personal skills such as: team work, negotiation skills and strategic thinking. Since this workshop was a pilot of the game, there were some improvements that could be made to make it even better. A feedback session at the end gave us an opportunity to give thoughts and opinions on the successes and shortcomings of the game which I hope the creators will develop. All in all, it was a day well spent and I will be implementing points learned from the session within my own PhD. Written by Luke Wilkinson, Cohort 4. Between 9am of Tuesday 6th March and 9am Wednesday 7th March, the Royal Society of Chemistry (RSC) ran its annual research poster Twitter competition. The idea behind the competition is for researchers to promote their own research area to not only the research community, but to a global audience through Twitter. Entrants had to post their academic research poster on Twitter, and use one of ten hashtags which best describes their area of research within chemistry along with #RSCPoster. Twitter users could then tweet entrants questions about their research. The RSC scientific committee kept an eye on posters which stimulated wide interest and featured innovative research; however prizes were given based on content & accessibility, design and interaction with other Twitter users. 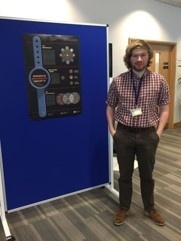 I was one of six entrants from Loughborough University with my research poster; “Is My Circuit Board Wet?”. The competition was a global event, drawing interest from the research community in multiple countries. In the afternoon of the competition, a Twitter account @ErrantScience, well known for making light hearted cartoon abstracts of RSC Poster competition entrants reproduced my poster, putting a comedic spin on the content. This was one of only six posters in the whole competition to receive the Errant Science treatment, which significantly boosted interest in my research. On Friday 9th March, it was announced I had won 1st prize in the materials category, winning £100 prize money and a certificate. The competition reached a global audience of over 1.9 million people, so to win was a massive achievement. As yet, I am undecided how I will spend the winnings. Even after the competition had closed, all of Loughborough’s entrants were still answering questions and receiving support from the scientific community which shows that STEM research at Loughborough is thriving. I attended the workshop on 07th March-2018 at the Chemistry building of University of Manchester. The workshop was organized by the Bruker UK Ltd. During the workshop several topics were quite informative and enabled me to gain insight into valuable knowledge regarding nanoindentation, In-Situ tribological testing in SEM and AFM as useful tool for 3D printing for certain applications. The talks on the atomic force microscopy enabled me to expand my knowledge on this topic. One new aspect of AFM that was demonstrated at the conference has potential to be incorporated in my later research. Conversations with several speakers directed me to further literature which would make good introduction to further aspect of my research. To help apply and develop their literature research on Deep Learning, Jake Rankin attended the Deep Learning Workshop. This would both provide experience with applying deep learning and an opportunity to discuss specific considerations with leading practitioners for implementing deep learning systems. 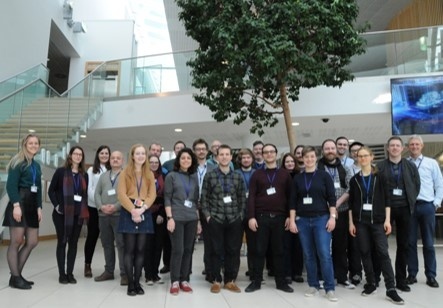 The Centre for Modelling and Simulation (CFMS) Hosted a Deep Learning Workshop at the Bristol and Bath Science park, consisting of talks from Cray, Nvidia Deep Learning Institute, TSystemes and CFMS. This was then supported by a workshop that used Nvidia’s Deep Learning GPU Training System (DIGITS). 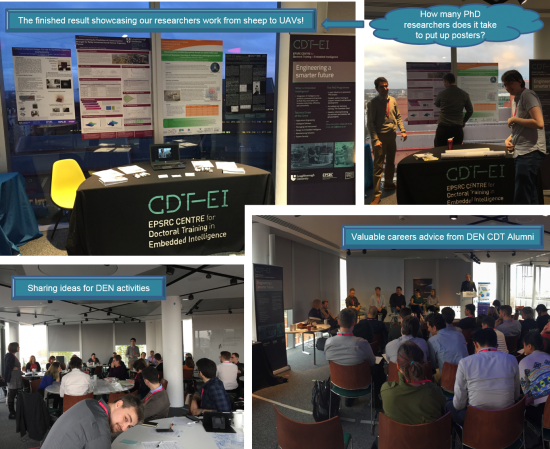 The purpose of this event was to help organisations understand the challenges of implementing deep learning and the presentations were focused on business applications of deep learning and clarifying the mechanisms of deep learning. Chris Hegarty (Cray, AI Enterprise Sector Development Lead) gave a useful presentation on the hardware and software required for the implementation of Artificial Intelligence Systems, highlighting several useful toolkits such as CNTK, TensorFlow and Caffe2 (All of which are available for use), but also highlighted a word of caution with regards to the data-processing required (Exceeding well above 25 Gflops) and the costs for algorithm training (~$25k). Adam Grzywaczewski (Nvidia, Deep Learning Solution Architect), who also led the Deep Learning Institute workshops, explained the workings behind neural networks very concisely, with focus on Convolutional Neural Networks (CNN), which would be the focus of our workshop. The conference was a useful experience that has helped to focus literature research and consider practical constraints for the project. The networking was a useful insight of business opinions on various deep learning methods and helpful feedback was shared.